A new animal pound could end up costing Baw Baw Shire close to $2 million as costs associated with the facility continue to soar. A report to be presented to council tomorrow indicates a new pound will cost about $741,500 - significantly more than the $150,000 estimates by officers just 10 months ago. Costs of the new pound are on top of the $1.2 million council paid for the privately owned two hectare site, which includes Utopia Pet Lodge. So how could a facility once championed as part of an "innovative" approach to animal management suddenly be causing Baw Baw Council so many headaches? 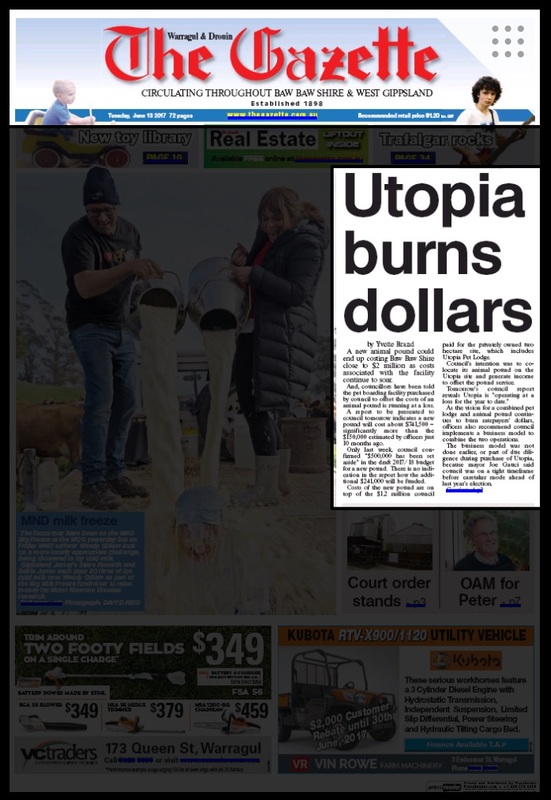 The business model was not done earlier, or part of due diligence during purchase of Utiopia, because mayor Joe Gauci said council was on a tight timeframe before caretaker mode ahead of last year’s election. The Gazette has made several requests for the business plan on which the council based its decision to buy the commercial facility. These requests have been denied. No details of the business plan or due diligence supporting the purchase have been made public. Did I say wow already? Because wow. Three weeks ago, The Gazette asked Cr Gauci what the due diligence process involved and why a business model and proper costings for a new pound were not investigated at the time. The mayor said due diligence was based on the Utopia business and potential to incorporate an animal pound on the site. “There was no business case done on designs, it was the potential of the site, licensing and do all the benefits weigh up,” he said. How do you "weigh up" the benefits of a new business, without a business model? Well, you don't. Which is why council is now scrambling to put something together. Since the purchase, council officers have investigated various business model options. The report to council says co-locating the pound with Utopia was the “most cost effective option” and recommends retaining the operations internally, with both facilities being run by the same staff. Well, cost effective in that it is currently losing money. Meanwhile - you guessed it. Pound pets are still going to the shithole pound. What is even going on in Baw Baw?